Sushizanmai kaiten-style sushi, originally uploaded by Camemberu. The other joint I wanted to try at Yodo-Akiba was Sushizanmai - a chain of sushi shops reputed to offer good tuna, with its special Tsukiji connections. 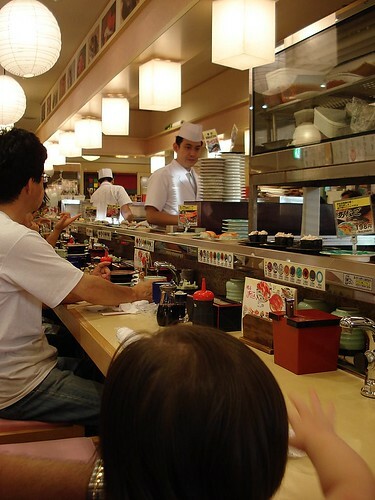 There are two Sushizanmai shops here, a sit-down restaurant at 1F and a conveyor belt (kaiten-zushi) one on 8F. I just wanted a quick bite, so 8F it was, same floor as Unasho. 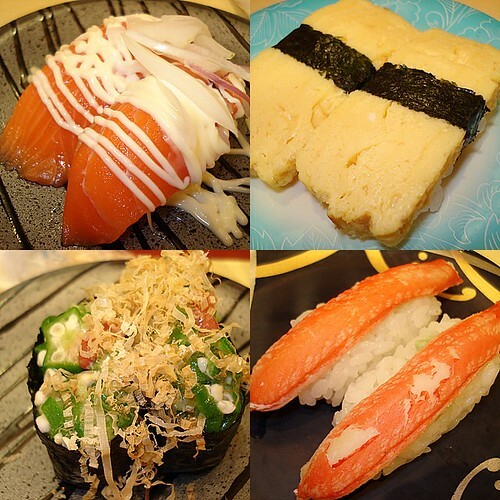 From top left: smoked salmon, tamago, snow crab and okra, originally uploaded by Camemberu. We began with a medley of different stuff off the conveyor belt. All of which were decent but just so-so. We also had to contend with an extra wriggly baby in the cramped dining area, so enjoying the food was not easy. 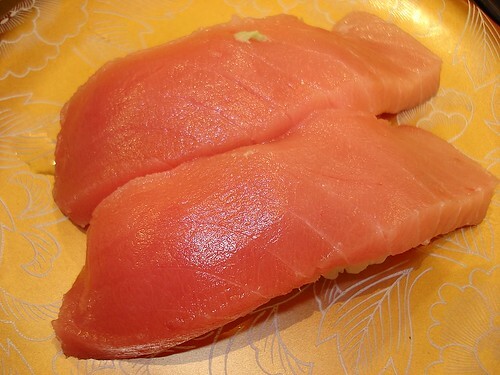 Ohtoro (fatty tuna belly), originally uploaded by Camemberu. All the tuna belly seemed to have been snapped up from the conveyor belt, so I ordered it a la carte. Ohh, thick and beautiful slabs of ohtoro arrived. But they were surprisingly tasteless. Guess I can't expect much for ¥398 per plate. 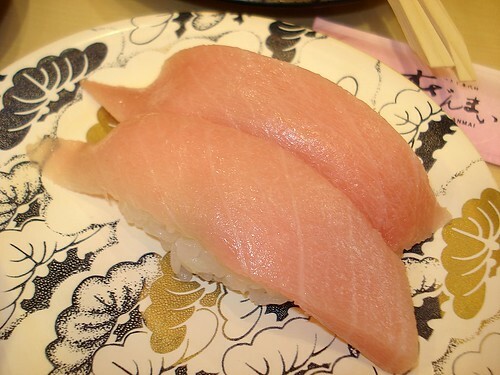 Chu-toro (medium fatty tuna belly), originally uploaded by Camemberu. I then tried the chu-toro (¥298) for comparison. More ruddy looking than ohtoro but almost equally tasteless. If you blind-folded me, I wouldn't be able to tell you what fish it was. 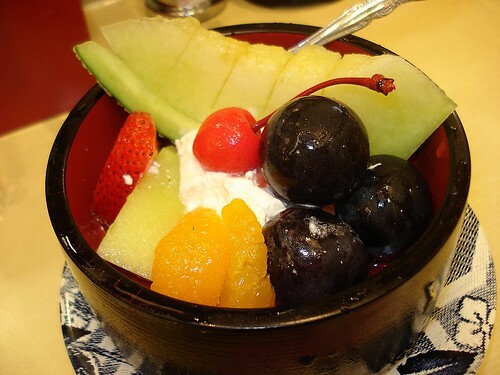 Fruits - divine bites!, originally uploaded by Camemberu. Surprisingly, the most satisfying plate we had was of the fresh fruits - the melon was extra fragrant, the grapes were almost like wine! It was also the most expensive thing we had there (maybe ¥498 or ¥598). Sadly the fish was disappointing. But oh well, serves me right for going to a conveyor belt joint (although I heard those in Japan can be good)! And somehow, this has put me off sushi for the next couple of days. Bleah. hey, nice reading about your travels in japan. well if you ever do make your way down to tsukiji.. the 2 pretty famous (albiet touristy) sushi shops - sushi dai and sushi dai wa (da he) are definitely worth a try. their premium sets should cost 3500 yen thereabouts. its excellent sushi for the price. you've gotta get there before 7 am though, otherwise the queue can stretch to an hour long, no kidding. Thanks, p! Yes, have heard of Sushi Dai and Dai Wa with their infamous queues. However, we didn't plan to visit this time as I have done Tsukiji twice and it's not easy going there in early morning with a baby in tow. Maybe next time when kid is older and can eat sushi!